Regardless of what you do on your girlfriends getaway with your BFF’s, eventually you’ll need to eat. 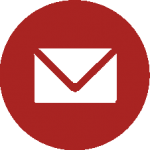 Whether you’re the kind of person who enjoys a gourmet dining experience or is completely happy noshing on a granola bar you found in the bottom of your bag, there’s a vast array of dining options available for all diners of all budgets. Unfortunately, during this trip I was unable to visit any vegetarian restaurants, but a girl has to make due with what she can find when on the road. TSG Tip: Try to discuss meal options in advance, if possible, and include everyone’s opinion so no one feels left out. Consider a variety of restaurants instead of focusing on a few and always opt for one outside of your hotel. Go on – get out and explore! If you live in a metropolitan area, the prices in St. Thomas probably won’t alarm you, but if you don’t — be prepared as it’s not an inexpensive place to dine out. 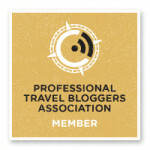 Once you get over the sticker shock, go forth and dine to your heart’s (or stomach’s) content. 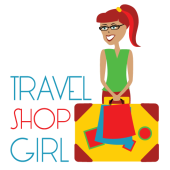 TSG Tip: Since it can be expensive to dine out, consider shopping in a local market if your hotel doesn’t include breakfast. Buy a few items that you can eat on the run and then you can reduce the amount of time dining and enjoy more of what the island has to offer. Always considered the most important meal of the day, breakfast is super important when traveling. Especially if you anticipate drinking shortly after lunch time. Gotta have something in your stomach to absorb that alcohol! 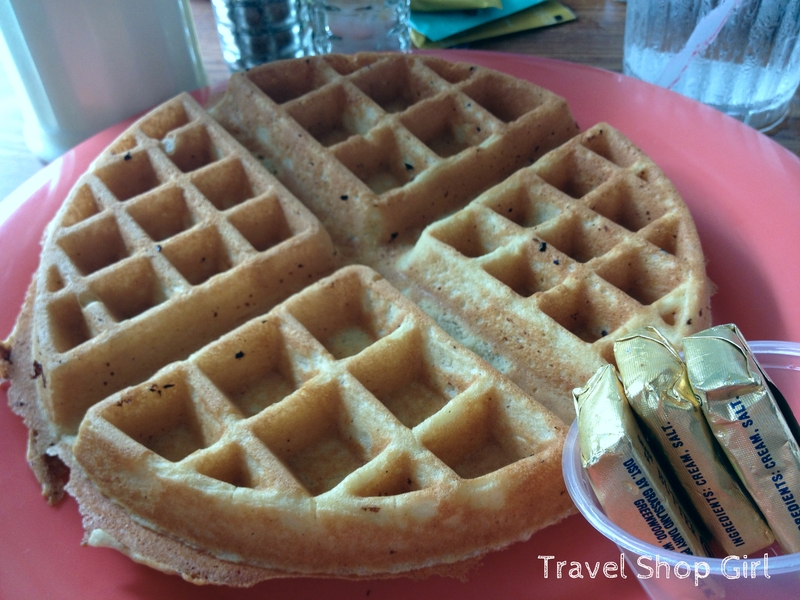 Two breakfast places we stopped at were the Delly Deck at Havensight Mall and Jen’s Island Café and Deli in downtown Charlotte Amalie. As someone who has a protein shake every morning, I’m not much of a breakfast kind of person anymore, but… I didn’t have enough room in my bag to pack my protein powder and shaker. If you can eat meat and eggs, expect to find much of what you would find on any breakfast menu from omelets to scrambled eggs to pancakes and more pretty much wherever you go in St. Thomas. Additionally, both restaurants also serve lunch with local fare and adult beverages. Outside seating at Delly Deck. Lots of inside seating, too. At the Delly Deck, open from 7 am – 5 pm Monday-Friday and 7 am – 4 pm on Saturday, I did the unthinkable and had half of a malted waffle (I know, I know — eggs and dairy and so many carbs), but it was good. Don’t worry, the roaming chickens and roosters shamed me. Other breakfast options include an English breakfast with eggs, grilled ham, bacon or sausage, tomatoes, mushrooms, and toast; Steak and Eggs; pancakes; French toast; and a continental breakfast. At Jen’s Island Café and Deli, open from 7 am – 5 pm Monday-Friday and 10:30 am – 4 pm on Saturday, there weren’t many choices at all for me so I had bread and cheese, kind of a toasted roll with somewhat melted cheese and Bush Tea made from lemongrass. But everyone else enjoyed and raved about the omelets, pancakes, French Toast, and even the breakfast burrito. After you’re finished eating, check out the artwork from local artists including Jen’s 14-year-old daughter. For casual fare with a great view of Long Bay, Fat Turtle is the restaurant to visit. Located at Yacht Haven Grande near Havensight Mall, Fat Turtle is open from noon until 10 pm 7 days a week. You’ll not only find seafood, but burgers, pizza, and salads here, too. Once again, unfortunately, my choices were limited, but I ended up with the Citrus Salad and a side of sweet plantains. Let’s just say I had a side of sweet plantains at almost every meal in the US Virgin Islands! Others at my table enjoyed the fried calamari and pizza as well as fish. This is a great place to people watch like the group of people who were doing Tai Chi near the entrance when we arrived. As an avid cruiser, I enjoyed a different vantage point to watch the ships sail out of port. I would probably head to Fat Turtle in the future for a drink and an appetizer if I could sit near the water and take in the view. TSG Tip: Individual bathrooms are located around the back of the restaurant. If you see a long line for the ladies room, use the men’s room as no one seems to go in there. Do yourself a favor when traveling and always try the local food. Don’t be one of those people that says, “Ewww. Where’s McDonald’s?” Maybe you won’t like it, but you can at least say you tried it and who knows? 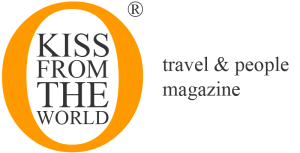 You might surprise yourself and find something new to add to your list of great food you enjoy from around the globe. In St. Thomas, a must go to dining destination is Gladys’ Cafe. 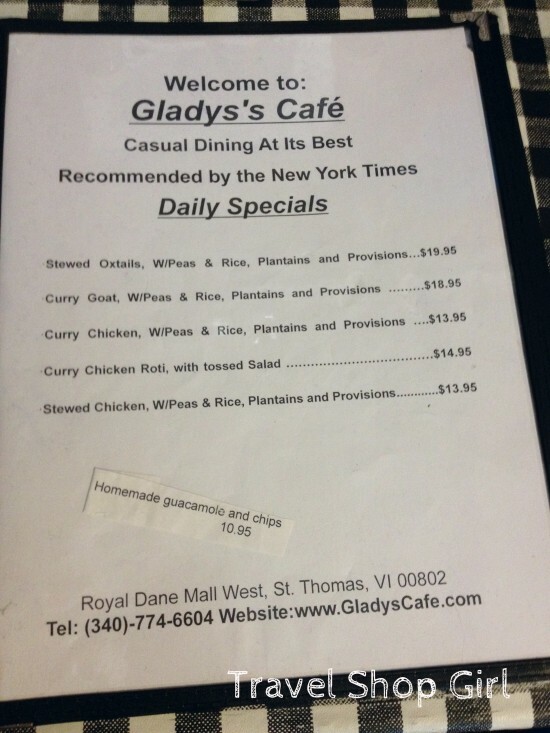 Serving a mix of Caribbean and American dishes and open from 7 am – 5 pm daily, I would definitely recommend this restaurant for anyone looking for authentic cuisine from the US Virgin Islands. You’ll find stewed or curried chicken, curried goat, stewed oxtails, conch in butter sauce, and of course, fresh fish. 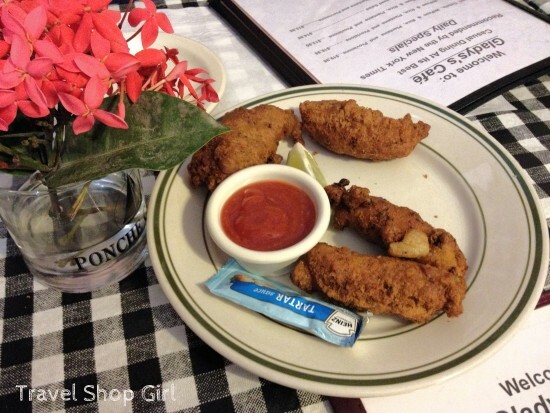 Diners start with conch fritters and you’ll see that they disappear quickly once placed down on the table. How happy was I when I learned that I could actually eat a meal here! 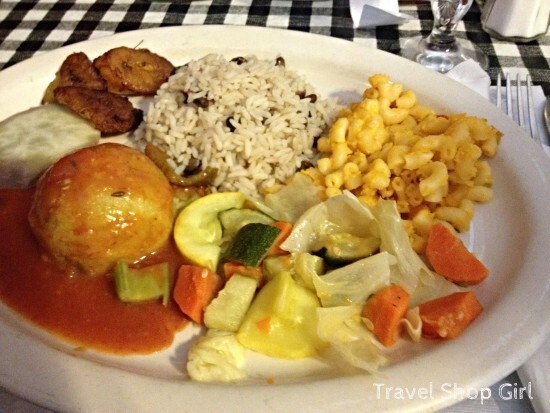 The server recommended the West Indian Plate, which was vegetarian and delicious. The rice and peas, sweet plantains, and the funghi (corneal mush) were all excellent! What really took it over the top for me was Gladys’ world famous hot sauce. I tried all of them from the mango to the mustardy one to the vinegar based one to my favorite, the red, which was really hot and all were delicious. 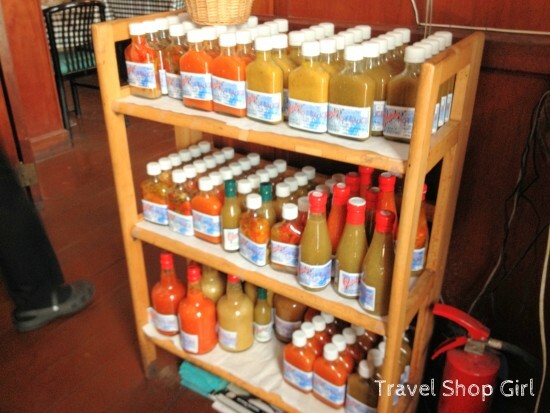 If I had checked a bag instead of bringing a carry on, I would’ve taken a case of Gladys‘ hot sauce back home with me! If you have room, try the desserts, too! Homemade desserts made fresh daily. Before taking the ferry to St. John from Red Hook Ferry Terminal, we stopped for lunch at Fish Tails. With quite a few options near the ferry terminal, why stop here? The location, the view, the food, and the service. Fish Tails is open for breakfast, lunch, and dinner 7 days a week from 7 am – 10 pm. Although definitely a restaurant with a focus on seafood and why shouldn’t it since it’s close to the water, I was resigned to have a salad yet again. But the generous portion of Greek Salad along with a side of the best sweet plantains ever made for a delicious lunch. Oh and how could I possibly forget the passionfruit margarita? It was absolute perfection as it wasn’t too strong or too week, too sweet or too bland. Goldilocks would approve and would say it was perfectly balanced. That is, if I was prone to sharing it with her, which I absolutely had no intention of sharing that drink with anyone! I was tweeting and posting pics on Instagram during and after my trip and Fish Tails tweeted that they liked the picture I posted. I used that time to mention that maybe (just maybe) they might want to add Gardein to the menu for the vegans/vegetarians out there and they responded and said they’d keep that in mind. It’s always nice to see businesses embracing social media and also being open to a non-traditional diner’s comments. Thanks Fish Tails! If you’re early for your ferry to St. John, definitely stop in for a drink or a meal and take in the view and the amazing breezes. 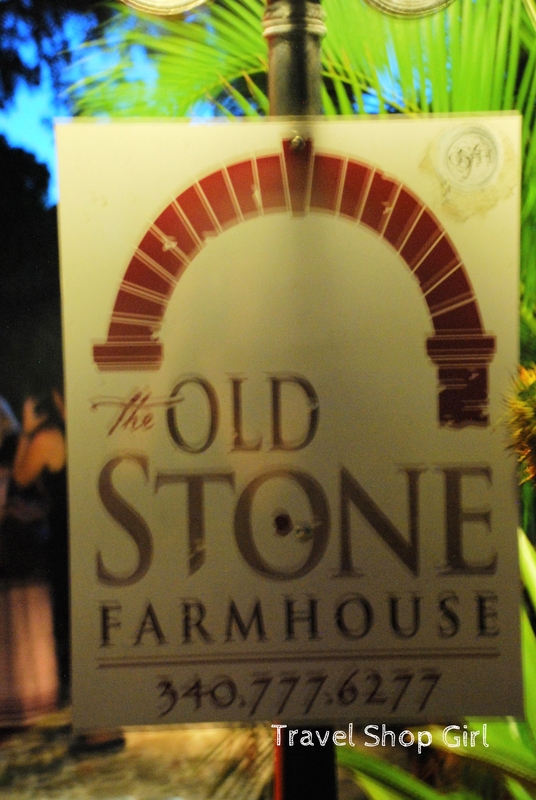 I was pleasantly surprised to learn that I’d once again have the opportunity to dine at the Old Stone Farmhouse. I covered my prior experience at the Old Stone Farmhouse back in December of 2011 in this post. This is the kind of restaurant where you can enjoy a fine dining experience in a historic setting without it feeling stuffy or uncomfortable. The restaurant is located in a 200 year old restored field house in the countryside of St. Thomas. Inside you’ll see native stone walls, original hardwood floors, and brick arches. If you’re looking for elegance and romance, you’ll find it here. But if you’re out with a group of your friends, don’t worry as you’ll be well taken care of and you’ll more than enjoy the historic atmosphere and ambiance. Executive Chef Christopher Spesak has created a menu inspired by French technique and local Caribbean ingredients including the island’s local fish. Alongside the menu is an an award winning wine program, wines by the glass, and a cocktail menu. Served a la carte were these monstrous barbecue chicken and cheese stuffed tator tots. Non-vegetarian diners completely enjoyed themselves. I was pleased to find a vegetarian option on the menu, Smoked Tofu Lentil Chili, which meant I could enjoy an entree and not just a salad alongside my dinner companions. If you order the Butchers Block selection, you have the opportunity to go into the kitchen and who wouldn’t? Diners who visit the kitchen also write on the walls. For the adventurous eater, I recommend choosing off the Butchers Block, which offers some unusual options, such as camel, but also fresh local snapper, salt prawn, and scallops. If you choose the Butcher Block option, you also get to go into the kitchen and speak with the chef as well as sign your name to the wall. How often do you get to do that during dinner? The Old Stone Farmhouse is open for dinner Wednesday – Saturday from 5 pm – 10 pm and Sunday from 5 pm – 9 pm, and for brunch from 9 am – 2 pm. 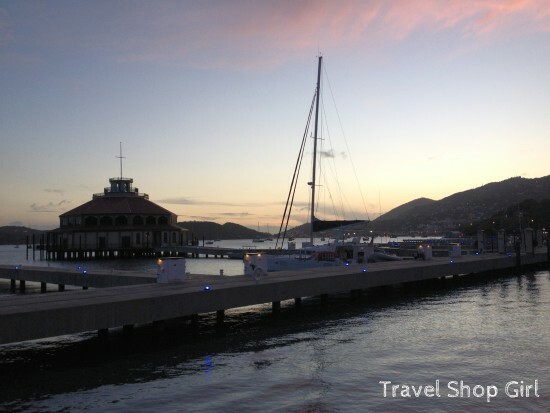 Next up in St. Thomas we’ll cover some of the activities that you and your friends can participate in while enjoying your girlfriends getaway in the US Virgin Islands.